July 9, 2018 - The United States Treasury Department is imposing new sanctions on the Iranian regime’s Mahan Air travel/tourism agency. “As a result of today’s action, all property and interests in property of Mahan Travel and Tourism Sdn Bhd that are or come within U.S. jurisdiction are blocked,” according to a Treasury statement issued Monday. 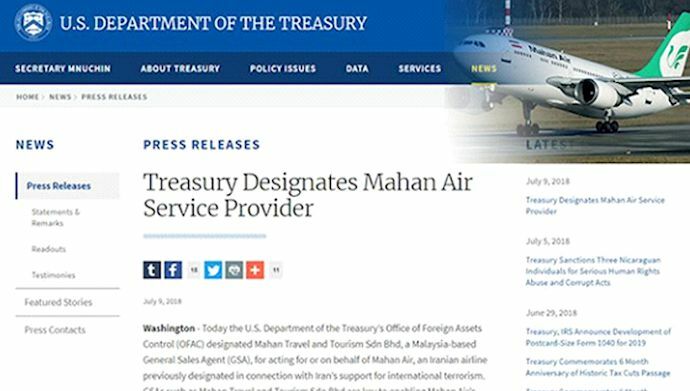 Mahan Airlines has already been blacklisted by the Treasury Dept. for transferring militia forces and weapons for the Iranian regime’s Revolutionary Guards (IRGC). Prior to this two Iranian regime operatives were sanctioned on charges of having the connection with Dena Airlines, and a Turkish businesswoman and three companies collaborating with Mahan Air were also sanctioned. The U.S. Treasury imposed new sanctions on Thursday against six individuals and three companies linked to the IRGC Quds force. US Treasury secretary, Steven Munchin said Iranian regime's individuals and companies who have been sanctioned were operating a vast network of money laundering and were funneling millions of dollars to the Iranian Revolutionary Guard’s elite Quds Force, just days after President Donald withdrew from the 2015 nuclear deal formally known as Joint Comprehensive Plan of Action, JCPOA. The IRGC is the main actor behind the Iranian regime’s ballistic missile program and its meddling in the countries of the region. The IRGC benefitted immensely from the nuclear accord, formally known as the Joint Comprehensive Plan of Action (JCPOA), which gave it access to billions of dollars to fund its terrorist activities abroad and its weapons programs. Cutting IRGC’s access to financial resources will deliver a serious blow to the Iranian regime’s regional ambitions as well as its security and suppression apparatus at home.